For four decades now, the “7” in the model designation of a BMW has been a worldwide recognised symbol of luxury, driving pleasure and innovations. With its top-of-the-range models, the premium car manufacturer showcases the latest results of its outstanding technological competence and a profound understanding of maximum comfort, progressive style and uncompromising quality. This tradition-steeped combination of innovation and exclusivity still strongly influences the character of the luxury sedans even in the sixth model generation and with the BMW 7 Series Edition 40 Jahre, it is currently expressed in a particularly concentrated way. With exclusive exterior and interior design features, these edition models emphasise the representative elegance and progressive styling of these luxury sedans. The BMW 7 Series Edition 40 Jahre will be making its world debut at the 2017 Frankfurt International Motor Show (IAA). The BMW 7 Series Edition 40 Jahre models are being produced in a limited quantity of 200 units and tailored to individual customer specifications at the BMW Dingolfing plant, which has served as the birthplace of these luxury sedans since as far back as 1977. The know-how gained there in the production of exceptionally high-class premium automobiles offers the ideal prerequisites for the production of the anniversary edition, the exclusive character of which is reflected, among other things, in extraordinarily sophisticated car body paints and in meticulously crafted interior equipment details. The edition models will be on offer from October 2017 with either a standard or a long wheelbase in conjunction with all six, eight and twelve-cylinder engines available for the BMW 7 Series (combined fuel consumption: 12.8 – 2.1 l/100 km; combined CO2 emissions: 294 – 49 g/km) as well as with optional intelligent four-wheel drive technology BMW xDrive and in the BMW iPerformance Automobile version with a plug-in hybrid drive system. Expressive body colours, exquisite materials, maximum manufacturing precision. Supreme presence, sporting elegance and emotionally appealing aesthetics characterise the exterior design of the current BMW 7 Series. In addition to the generous amount of space and modern functionality, it is above all the exquisite and meticulously processed materials that contribute towards a feel-good ambience. The BMW 7 Series Edition 40 Jahre enhances the fascinating aura of these luxury sedans first and foremost through expressive car body colours. There is a choice of two variants. The exclusive BMW Individual colour Frozen Silver metallic sets a markedly progressive accent, its silk-matt sheen intensively emphasising the controlled powerful design of the exterior surfaces. 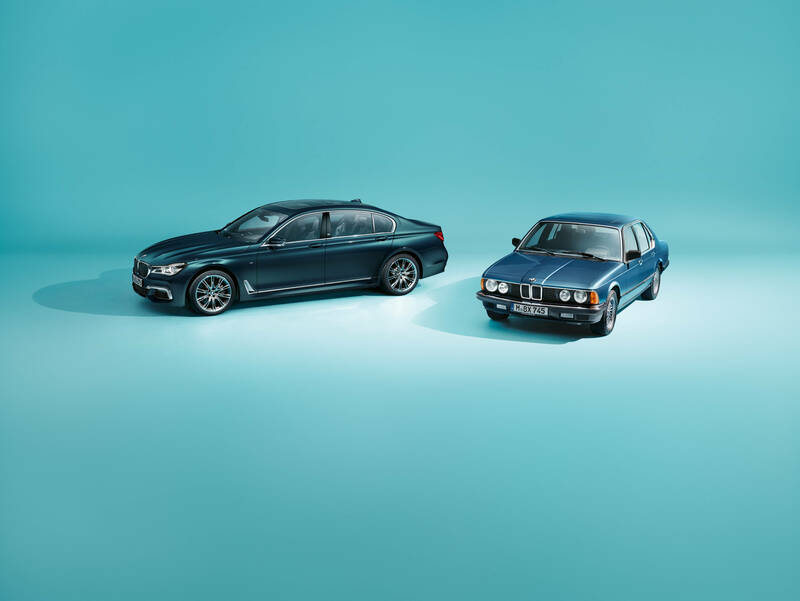 The exclusive BMW Individual body colour Petrol Mica metallic takes up on the tradition of discreet and elegant shades of blue used on the bodywork of BMW luxury sedans. It fascinates through exceptional brilliance, appealing iridescent effects and a unique impression of depth. The colours, which are applied in a particularly elaborate process, come in conjunction with the M Aerodynamics Package, the BMW high-gloss Shadow Line and 20-inch BMW Individual light alloy wheels in a V spoke design. A further exterior design feature is the edition signet designed exclusively for the model anniversary and located on the B pillar coverings and on the door sills. Inside the edition models too, the combination of selected materials, exclusive design and high-precision workmanship so characteristic of BMW Individual equipment options provides for an outstandingly sophisticated appearance. The BMW Individual full leather trim Merino fine grain in the colour combination Smoke White/Cohiba or Smoke White/Black with hand woven piping in Smoke White harmonises perfectly with the BMW Individual Alcantara Smoke White roof liner. Moreover, BMW 7 Series Edition 40 Jahre models are all fitted with comfort seats both at the front and rear. BMW Individual interior trim strips are offered either in a black piano lacquer finish or in the high-grade wood finish Eucalyptus straight-grained Smoke Brown high gloss, depending on the upholstery colour. Within the area of the instrument panel on the front seat passenger side they boast an edition signet. The exclusive flair is rounded off by two Smoke White comfort cushions from the BMW Individual manufactory, which, like the headrests, also bear the edition signet, as well as by floor mats in Smoke White with either black or Cohiba brown edge binding respectively. 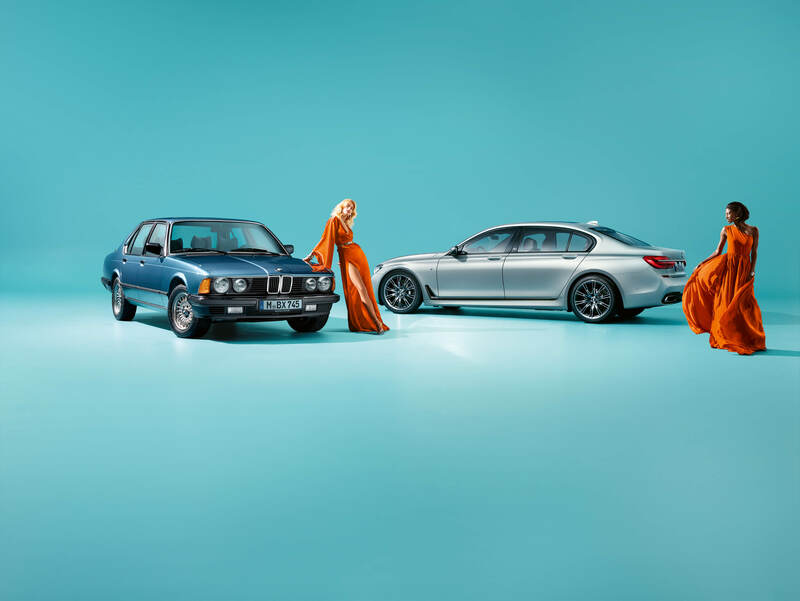 Redefining luxury – the BMW 7 Series’ mission over the past 40 years. Exclusive design features contribute towards the unique appearance and unmistakable interior atmosphere offered by the edition models. All options from the range of special equipment for the BMW 7 Series are available for an upgraded configuration according to the customer’s personal preferences and with which additionally enhanced driving pleasure and travel comfort can be achieved. With that, the BMW 7 Series Edition 40 Jahre represents the consistently further developed status of these luxury sedans as a symbol of supreme styling and innovative technology over six model generations. For four decades now and with its top-of-the-range models, BMW has managed to create a brand-typical interpretation of exclusive driving pleasure, whilst also giving the term luxury a new meaning time and time again. In its latest generation, the still existing balance between sportiness and elegant presence that is so characteristic of the BMW 7 Series is bestowed with an additional appeal through driver assistant systems with which BMW is assuming a leading position on the way to fully automated driving, as well as with connectivity solutions that seamlessly connect exclusive mobility with the driver’s digital lifestyle. With systems such as the steering and lane guidance assistant, which can be activated up to a speed of 210 km/h, and the lane departure assistant, available at speeds between 70 and 180 km/h, the current BMW 7 Series achieves an unrivalled level of functionality for the optimisation of comfort and safety in varying traffic situations. The remote parking function, which made its world debut in the current BMW 7 Series, is yet a further innovation underlining BMW’s development expertise in the field of automated driving. Additionally, the personal digital mobility assistant BMW Connected offers a networking technology that is unique in the automotive sector and facilitates connectivity between the vehicle and individual end devices such as the Smartphone and the Smartwatch via the flexible platform Open Mobility Cloud, helping the driver reach his or her destination comfortably and stress-free. Furthermore, the BMW 7 Series is the only model in its competitive environment to feature the Remote 3D View function. This technology provides the driver with a live image of the vehicle and its environment on the Smartphone. The classic luxury features also redefined in the new BMW 7 Series include the ride comfort and well-being of passengers in the rear compartment. The optional panorama glass roof Sky Lounge, Executive Lounge Seating, Executive Lounge Rear Console and Rear Seat Entertainment Experience featuring BMW Touch Command also set standards in this field. By tradition, the BMW 7 Series assumes a pioneering role for technological innovations that ultimately also enhance driving pleasure in other series and regularly set decisive impulses for the entire automotive sector. Whether the Check Control System (1977), the first 12-cylinder engine in a German post-war automobile (1987), the first integral navigation system in a European production vehicle (1994), the revolutionary iDrive operating concept, the BMW Online mobility service including E-mail account (2001) or the premiere of unrestricted Internet usage inside a vehicle (2008), path-breaking innovations have been consistently first presented in a BMW 7 Series across many generations. The list of technological milestones linked to the history of the BMW 7 Series is therefore long and fascinating. In order to continue with this tradition, the expertise gained from the development of BMW i automobiles was also incorporated into the current model generation. An intelligent material mix combining carbon fibre reinforced plastic (CFRP), aluminium and steel into the bodywork structure lends the BMW 7 Series a unique synthesis of solidness and lightweight construction. BMW eDrive technology used on BMW iPerformance plug-in hybrid models offers the promise of luxury driving comfort that is also locally emission-free. Irrespective of which engine variant the customer opts for, the BMW 7 Series completely redefines supreme driving pleasure also behind the wheel. BMW gesture control made its world debut in the new BMW 7 Series. The Driving Experience Control feature also offers the ADAPTIVE mode with which the vehicle set-up is adaptively oriented to driving style and prevailing road conditions. Ride comfort and sportiness benefit to an equal extent from the optional Executive Drive Pro system with Active Roll Stabilisation. Moreover, when launched, the current BMW 7 Series was the world’s first luxury sedan to be equipped with laser light headlamps. BMW laser light with anti-glare high beam BMW Selective Beam is available as an option. Thanks to this technology, the range of the high beam vs. LED headlights increases to as far as 600 metres – in the true sense of the word a further pioneering innovation featured by the BMW 7 Series.